I visited Latvian capital Riga with my wife between 11-14 March 2009. Among the sightseeings in this very beautiful city I visited many FM-stations, too!! * Riga has 717 000 people (about 42% both Latvian and Russian). 2.3mill people in Latvia. 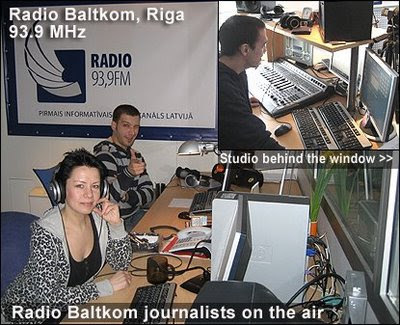 * There are 12 commercial FM-stations in Riga (half Russian/ half Latvian). 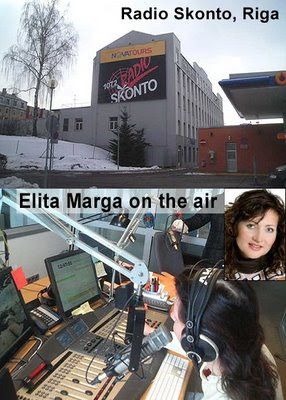 * 3 national commercial stations: Radio SWH, Star FM and European Hit Radio. * There are not very tight and clear music-formats on radio (excl. rock). Reason must be small market. * Most of the FM-transmitters are located in the big TV-tower. It is the 3rd tallest building in Europe (368,5 m). 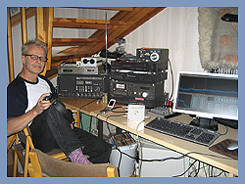 FM-signals have too high level in the Riga centrum. FM-receiver overloads very badly!!! I did not make any appointments with the stations beforehand, I just walked in (which is not a good way) and therefore I did not try to take much time per visit. These days people are busy at the radio stations everywhere. However, all stations were friendly and showed me kindly places around and answered the questions! The first visit was a group of 4 stations which are all located in the same floor: Mix FM (102.7 MHz), Baltkom (93.9), Fit FM (99.5) and Jumor FM (88.6). This group is quite new compination as Fit FM, Jumor FM and Baltkom are founded about 1-2 years ago. The owner is Russian based company. Mix FM is the main product in Russian language on 102.7 MHz (elder pop-station). Baltkom is news-radio in Russian (with very interesting way of programme production) with stylish music. 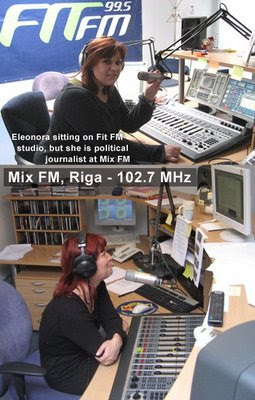 Fit FM is music channel in Latvian and Jumor has no presenters (music and tv-soundtracks). Journalist/DJ 'Eleonora Rozevelt' (arist-name) kindly showed me all the stations. She also recorded a jingle from me in Finnish language for Mix FM! I hope it will be played... All these stations sounded very good! Radio SWH is the oldest commercial station in Latvia. It is founded in 1993 and is now nationwide with 4 regional studios. I was surprised when I heard this station first time around 1995 because it sounded very professional from the very beginning!! Jingles had very good production! Later the founder Zigmars Liepiņš, confirmed me that he used US based consulting to build up the station. Zigmars sold SWH-stations to big Irish-based media company Communicorp in 2007, but he is still involved in the board of the company and visits the station every now and then. This was bad news for me because I thought it would have been a pleasure to meet him personally!! 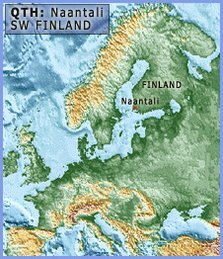 Communicorp is also operating in Finland with stations Suomipop, Metro FM and Groove FM. 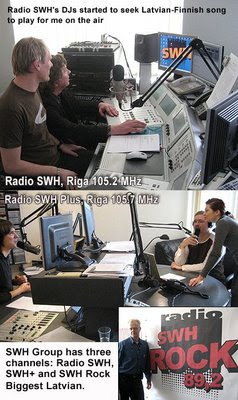 SWH is operating three channels: Radio SWH (Riga 105.2 MHz), SWH Plus (105.7 MHz, Russian language) and SWH Rock (89.2). SWH Rock has only 2h live-DJ daily and the rest is non-stop. I suppose this is the only rock-channel in Baltia. It is mostly tuned by Russian speaking people. SWH's revenues for 2008 was over 2mill Euros. Really big station with many safety-guards outside! Self-advertisment manager Laura Dukjana-Lice kindly gave station-tour!! It was also a great pleasure to see Radio Skonto, good old local radio in Riga. Today the trend is that FM-stations are grouped under big companies who run many channels at the same time, but Radio Skonto is positive exception. I thought first that this station is a small one and close to death, but it was a big surprise that it is still very well tuned and professional. They even have music-inquires which is very expensive to arrange. All stations had very modern equipment and facilities - looked and sounded out professional. I did not try to solve the price-level of radio-advertising, but it must be high in Latvia because there were more people working at the stations than I expected. I suppose the base for that is the high price-level of television advertising, but I am not sure.